The implications of the rise in student higher education debt have captured many headlines, especially as student debt passed total credit card debt a few years ago. A greatly under-appreciated element is that the debt distribution has shifted substantially – from mostly large public campuses with many students, to private, for-profit online programs. This new research from the Brookings Institution show the extraordinary shift in debt patterns from 2000 to 2014, when 8 of the top 10 institutions for total student debt are now for-profit institutions. 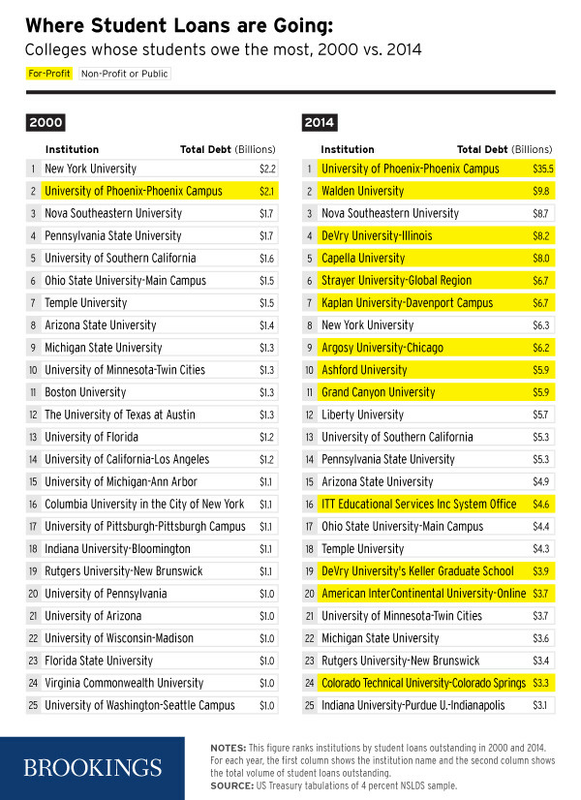 The table below (from Vox) shows this major change most clearly (and readers should note that the public institutions with highest debt are large campuses, as this is not expressed as per student debt). The federal government is beginning to crack down on such institutions, when they do not provide value (in terms of good paying jobs) for the student investment. And, it is illuminating that students from public institutions are much less likely to default on their student loans, given their combination of higher paid jobs and less debt.